The natural sciences and the field of planning are not neutral or objective areas of inquiry but influenced by the larger society of which they are a part. A substantial part of my work explores the natural sciences and planning procedures as factors in framing natural resources, conservation and development issues. I am inspired by theoretical and critical concepts that suggest that the terms of environmental issues are not only important to investigate, but also the frames that set the same terms. In many environmental dispute negotiations, for example, the environmental impact is confined to a particular place, and the natural science evidence is vetted for that place only, while there may be wider consequences of the development in terms of cumulative and synergistic impacts. I have explored the politics of science and planning in many situations, including sewage systems, anti-pesticide lawn legislation, invasive species, and aggregate extraction in the Greater Toronto Area, and spruce budworm spraying in New Brunswick and Nova Scotia. I have supervised several students who have written critical accounts of the position and role of science in current planning and conservation disputes on the Oak Ridges Moraine and Greenbelt, including housing developments in Newmarket, aggregate developments in Caledon, white-tailed deer management across the Greenbelt, stormwater management in the Toronto region, and the management of abandoned landfills. Students with a planning and natural science focus who would like to learn more about such processes and be challenged by wider critical analyses may want to discuss such matters with me. Macaraig, M. and L. Anders Sandberg, “The Politics of Sewerage: Contested Narratives on Growth, Science, and Nature,” Society and Natural Resources, Vol. 22, No. 5, 2009, pp. 448-63. Sandberg, L. Anders and J. Foster, “Challenging Lawn and Order: Environmental Discourse and Lawn Care Reform in Canada,” Environmental Politics, Vol. 14, No. 4 (July 2005), 478-94. Foster, J. and L. Anders Sandberg. “Friends or Foe? Invasive Species and Public Green Space in Toronto,” Geographical Review, Vol. 94, No. 2 (April 2004), 178-98. Sandberg, L. Anders and P. Clancy). “Politics, science and the spruce budworm in New Brunswick and Nova Scotia.” Journal of Canadian Studies, Vol. 37, No. 2 (Summer 2002), 164-191 (special issue on environmental history). 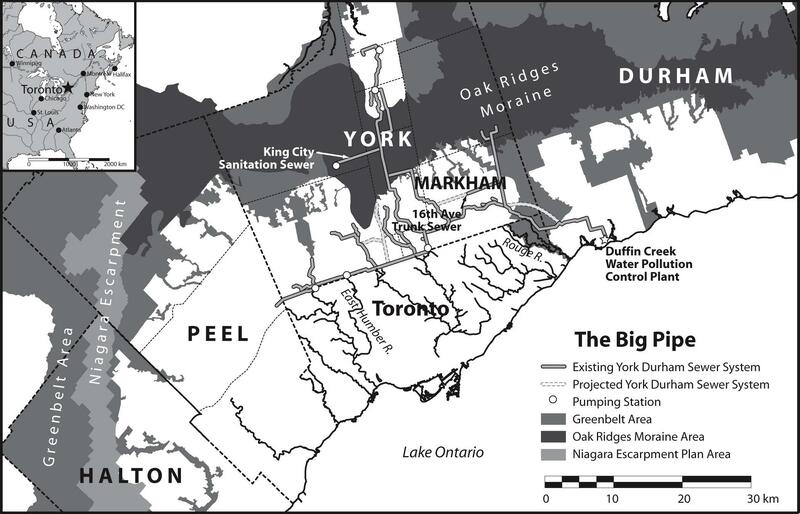 The York-Durham Sewerage System or “Big Pipe” as it is often called carries sewage long distances from many communities on the Oak Ridges Moraine and beyond to a sewage treatment plant in Pickering on the shores of Lake Ontario. Deemed essential to accommodate the growth of the region and safe for humans and the environment, the Big Pipe has some powerful supporters among planners and natural scientists. Opponents construct the Big Pipe technology as inappropriate for vulnerable human bodies and natural environments while expounding slow local growth. They seek support from planners and natural scientists who praise the virtues of local sewage treatment.